Take A Sock At Love In Fayetteville! If you’re looking to escape this Valentine’s Day, Fayetteville is calling your name. Whether you are looking for a weekend getaway of pampering and relaxation and sweet treats or a weekend of adventure with your love, we have something for you! Enjoy a steak dinner for two, wine and a room on Valentine’s Day for just $89.95 at the Quality Inn New River. You can also enjoy the dinner package alone for $39.95 at Elliott’s Whitewater Bar & Grill. Looking for peace, relaxation, and a touch of adventure? The Historic Morris Harvey House has created the perfect combination for you and your loved one. The Morris Harvey House is offering “A Valentine’s to Remember” package that includes: luxury accommodations for two, Morris Harvey House Wine Glasses, a decadent tray of chocolate covered strawberries, and a gourmet breakfast for two at the B & B. Roses, massages, and other services can also be arranged for an additional fee. Lafayette Flats makes the perfect getaway any day, but the Flats are upping their game with a variety of Valentine’s Day indulgences to enhance your retreat. If you act fast they can arrange to have a custom painting of you and your loved one waiting for you created by West Virginia artist Ian Bode, for an additional fee. You can walk into your Flat and find a bottle of chilled bubbly waiting for you along with delicious West Virginia specialty chocolates, bountiful flameless candles, and beautiful fresh flowers. Fayetteville just topped the Best of West Virginia List for Dining across the board. Nervous about your first Valentine’s Day together? Then the mellow atmosphere of sharing pimento cheese fries in Secret Sandwich Society or sharing pizza and wings at Pies & Pints may suit you more. If you’re looking for a romantic dinner enjoy the Station’s farm-to-table menu. Maybe breakfast is your jam; indulge in pancakes for two at Cathedral Café or chocolate chip waffles at The Iron Wood Eatery. We recommend you do a course at each, it is Valentine’s Day. Make sure you save a little room for something sweet. Think outside the box and gift your sweetheart with an experience. Try a new adventure together with a Valentine’s Day Bridge Walk or winter zip lining trip. Pamper your significant other by booking a relaxing massage at Canyon Rim Massage & Body Work in downtown Fayetteville. Winter is our slow season making it the perfect time to enjoy the solitude and reconnect with your partner. Bundle up with your sweetheart and hit the trail, hike out to Long Point in the golden hour. Take a scenic drive, bring a blanket and watch the fog rise over the New River. Explore icy waterfalls, breathe the fresh air, and reconnect. Take a window shopping stroll through Fayetteville, where historic buildings house upscale boutiques, adventure shops, outfitters, a bakery, cafes, and antique shops. Stop by Kool Beanz to warm up with a cup of coffee and challenge your sweetheart to a round of putt-putt golf at their indoor course. The New River Epic Escape is a fun and unique experience for anyone to try. Put your relationship to the test and try one of their challenging escape rooms. 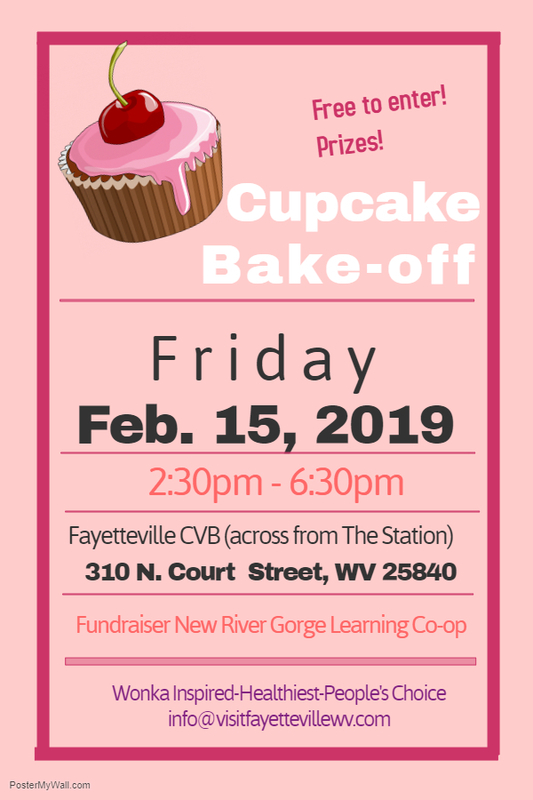 Join us for a fun-filled Valentine’s weekend in historic Fayetteville with lots of fun events planned! We are very excited to host Fayetteville’s first Wonka Walk, a sweet treat walk through town Saturday and cupcake bake-off Friday. Enjoy Chef demos, live music, a winter farmers market, and more! Stay tuned as we post the weekend’s full event list here. Come play and stay, https://visitfayettevillewv.com/lodging/. There is still time to book a weekend getaway to Fayetteville to ring in the New Year. Get pampered in one of Fayetteville’s Bed and Breakfast Inns, or get away and enjoy a tranquil stay in a cozy cabin. Fayetteville has something for everyone to help you ring in the New Year. You can enjoy a champagne toast at midnight or dance the night away with several New Year’s events to choose from. Maybe you are more of a thrill seeker; join us for Fayetteville’s Annual Polar Plunge into the New River on New Year’s Day. Or rejuvenate with a First Day Hike in the gorge. Start your evening off with a prime rib dinner for two for $39.99 at Elliott’s Whitewater Bar & Grill. 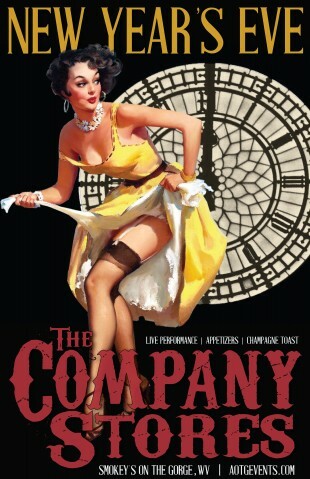 Bring in the New Year with entertainment from ” Big Ugly”, Dave Willis and enjoy a champagne toast at midnight. Stay overnight on-site at the New River Quality Inn with nice deals on new years packages and enjoy a free continental breakfast in the morning. Adventures On The Gorge and The Company Stores invite you to ring in 2019 with phenomenal modern rock music, exquisite food and craft drinks underneath the stars on the rim of the New River Gorge in West Virginia. Tickets cost $39 after December 25, which includes appetizers and champagne toast. Cash bar is also available (credit cards accepted). You can stay in the heart of Fayetteville and play on the edge of the New River Gorge. 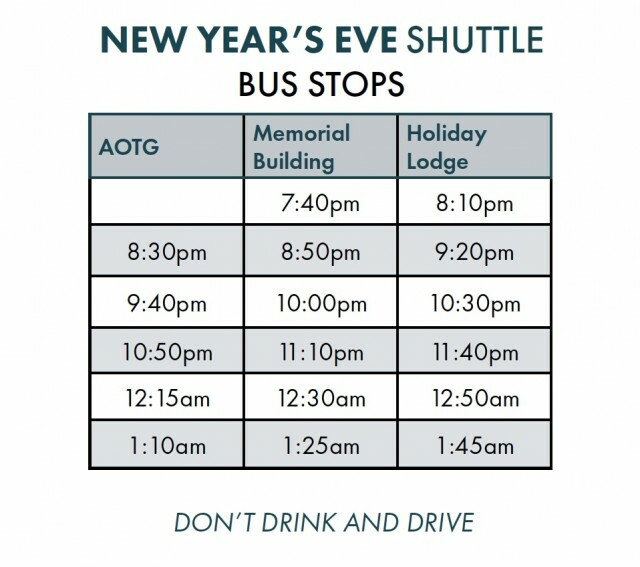 Adventures on the Gorge will be offering a free shuttle service included with your ticket New Year’s Eve. The Memorial Building in Fayetteville right across from the Historic Morris Harvey House Bed and Breakfast is one of the main stops. You can also talk to your driver to request stops on the main loop including Lafayette Flats, and many of the vacation rentals in town. The party starts at 9 pm with DJ Frankenstein with a leather and lace themed New Year’s Eve Party at Monkey’s Uncle Bar & Grill. No Cover! Looking for fun for the whole family? Take a drive through the impressive wonderland of winter lights at the Fayette County Park The last night to check out the lights is December 30th. Join Active Southern West Virginia on their First Day Hike. Connect some of the trails at Ace Adventure Resort in Oak Hill on a 6-mile loop with Community Captain Levi. Meet at the Welcome Center at ACE Resort at 10 AM. Make being active a part of your New Years resolution. At the stop sign turn right if coming from Beckley, turn left if coming from Fayetteville. You can also stop by the visitor center and pick up a trail map and we can help you plan your own First Day Hike with an abundance of trails to choose from! Dive into the New Year with Fayetteville’s Polar Swim. Every year locals gather at Fayette Station on New Year’s Day for a dip in the New River at 1 pm. Participants must sign a liability waiver before the swim. Waivers will be on site. Fayetteville is all dolled up for the holidays. Stop in one of our local coffee shops to warm up while you stroll around town. Fayetteville has a variety of unique shops, from boutiques, adventure gear shops, antique stores, and more. You will also want to take advantage of our awesome restaurants, several Fayetteville Restaurants topped the Best of West Virginia List for 2018. If more adventure is your resolution we can help you get started. Book a New Year’s Day Bridge Walk at a special New Year’s price of $49. Bridge Walk has added a “can’t miss” event. At noon, with an extra Bridge Walk tour and you’ll get to view the spectacular Fayette State Polar Bear Plunge high above the frigid water. It was a hit last year…..bring your camera and zoom in on the fun….without the frostbite! Winter Place Ski Resort is just a 45-minute drive from Fayetteville. If you are feeling up for a challenge test yourself at the New River Gorge Epic Escape Game. You still have time to book a New Year’s getaway. Take advantage of winter rates and get rejuvenated to take on the new year.